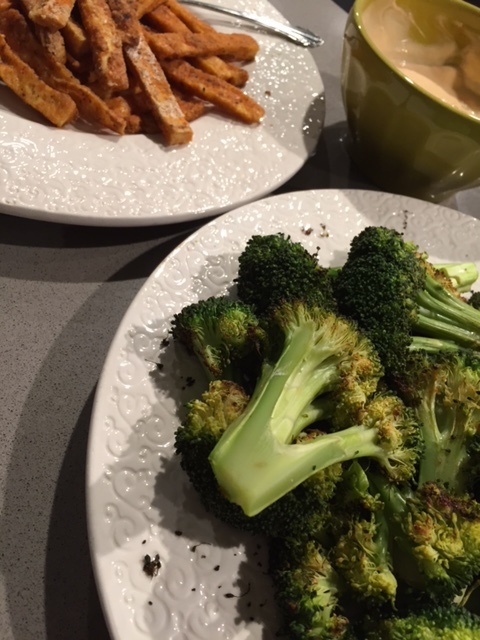 As much as we can, we try to make a point of cooking meals together. This is a way for us to spend time with each other while creating something new to keep us (our significant others and Lauren’s daughter) happy. While we feel like it is easy to continue perfecting our favorite recipes, sometimes we just love a good challenge. Especially one that requires us to go into the refrigerator and make a complete meal out of ingredients we already have on hand. This week, we took this particular challenge very seriously. We figured we couldn’t go wrong by making an old favorite … a quesadilla, but added unexpected ingredients to give this standard meal a Greek twist. 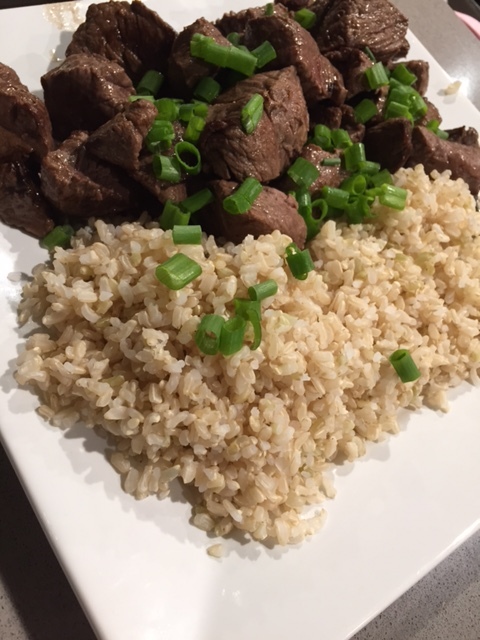 Before just “winging it” we decided to do a quick Pinterest search and found this recipe that gave us just enough information to get started. 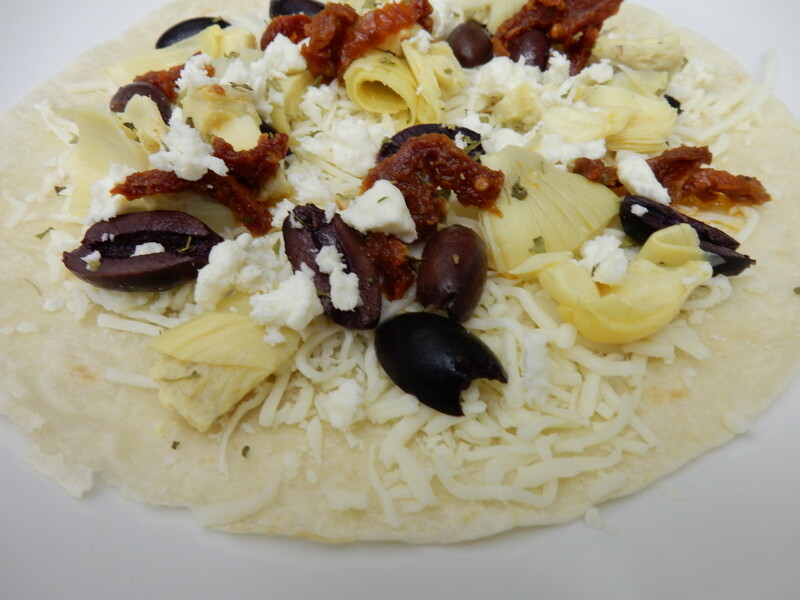 We sprinkled mozzarella cheese on a flat tortilla and added these toppings for their delicious Greek flavors: sun dried tomatoes, kalamata olives, artichoke hearts, feta cheese, and a touch of oregano. 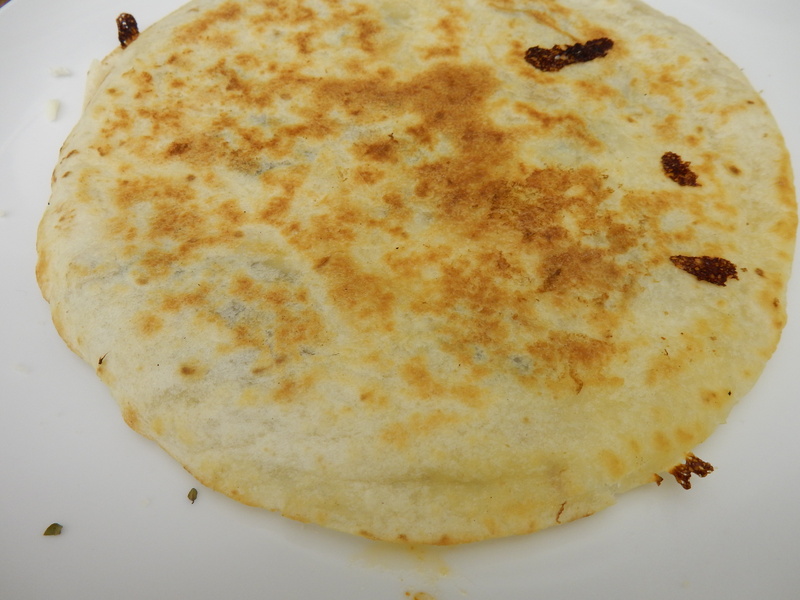 We then added a second tortilla to the top and cooked all together in a frying pan until golden brown. This was honestly so amazing. We really aren’t sure if we can make a plain quesadilla ever again. 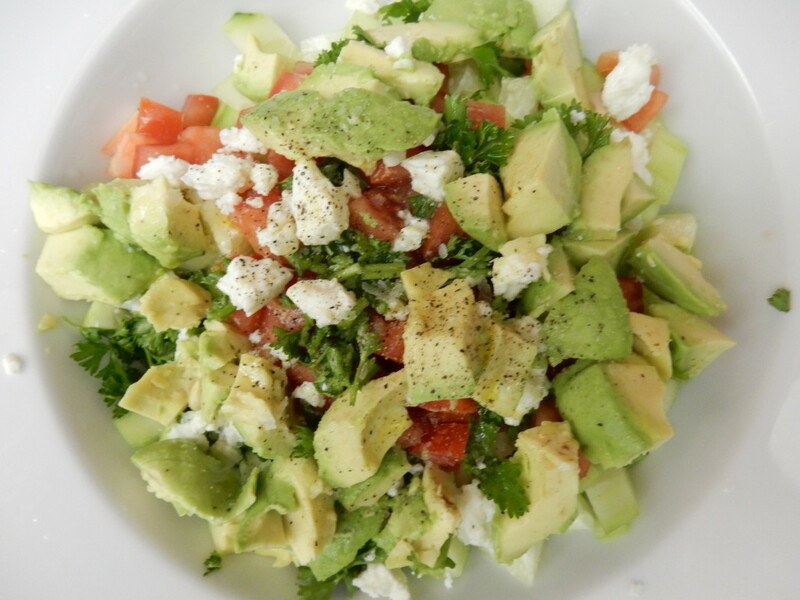 A traditional Israeli salad goes Greek with a bit of parsley, feta, and avocado. 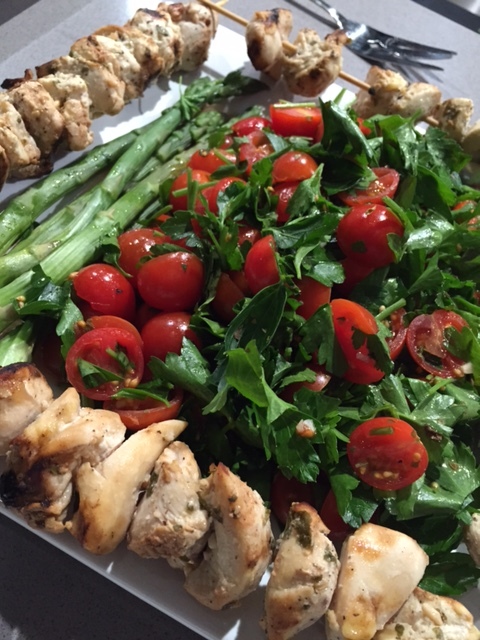 We dressed this delicious side dish with fresh lemon juice, EVOO, sea salt, and pepper. 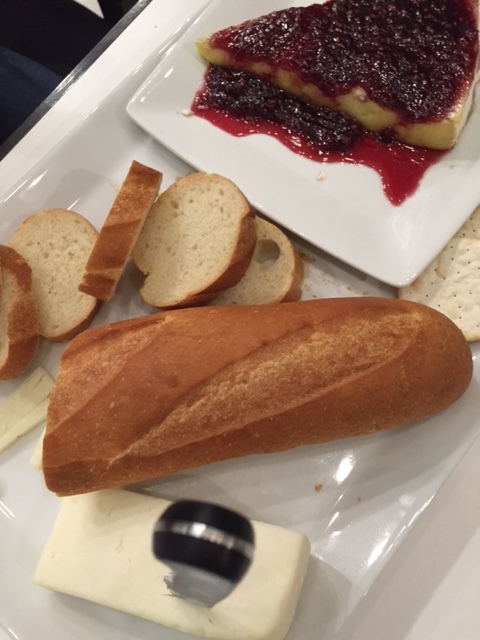 It was the perfect companion to our Greek quesadilla. We truly love cooking Side by Side (when we have the time) and hope to share many more recipes that we create “on the fly” with all of you in the future. If you are looking for an appetizer idea for the Super Bowl this weekend, whip up a few of these Greek quesadillas and slice them like a pizza. Your guests will go crazy over them! We promise! Since our very first post, Lauren’s husband Scott has been bugging us to write something sports related. Although, we have told him numerous times that our readers are just not interested in scores and play by plays, he did finally win us over. Last year, we decided it would be fun to put together a menu to serve your guests based on the local cuisine of each Super Bowl team and this year we decided to continue that tradition. This year’s menu is a little bit formal, a little bit festive, and a whole lot tasty. 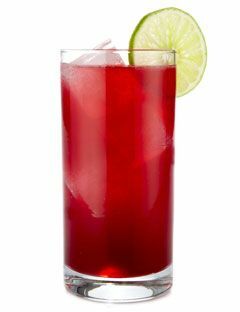 The Cape Codder is just a fancy name for a vodka cranberry and happens to be the state drink of the home of the Patriots … Massachusettes. It represents one of their team colors as well (red). Add ice and lime if you are feeling extra sassy! 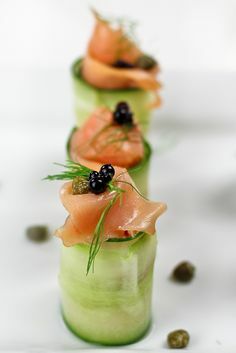 A delicious and healthy party bite made with an ingredient Seattle is known for … smoked salmon. This is listed as one of the five most decadent appetizers in Seattle and can be found at the Madison Park Conservatory. 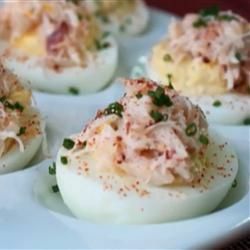 How can “luscious whipped egg topped with fat hunks of Dungeness crab” be bad? Obviously it goes without saying that New England is known for this treat! 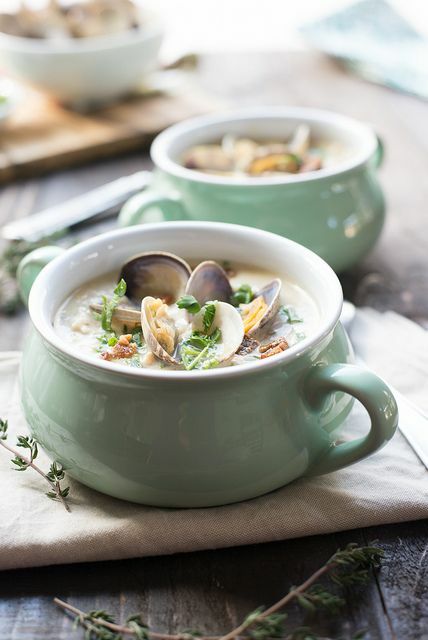 Delicious all year round, not just when it’s cold … We love clam chowder! 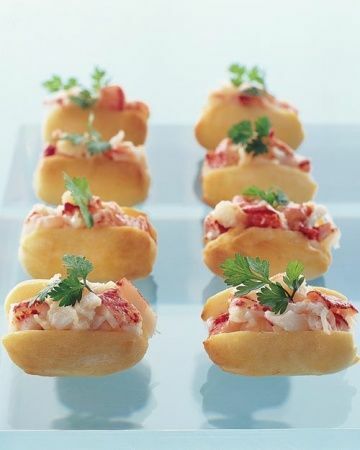 These mini lobster rolls are easy to devour in just one bite! … or you can try out this full size version! 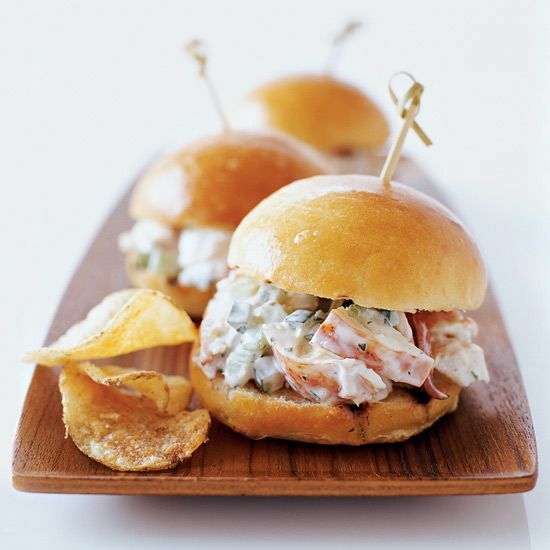 We love sliders especially when they are filled with lobster! Seattle is known for its coffee, and although you could easily end your meal with a hot cup of joe, this coffee flavored ice cream will just as well do the trick. 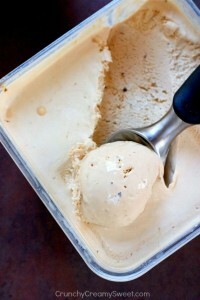 Ever considered making your own ice cream? 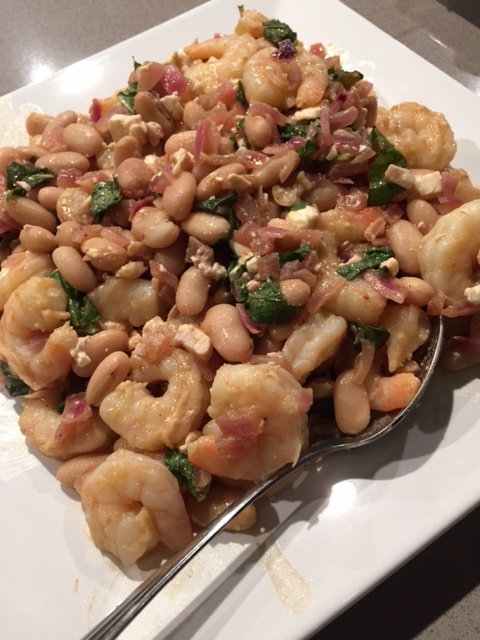 This site boasts this recipe is easy to use and requires no churning. Worth a try? We think so! We hope you enjoyed this inspiration post. All of the recipe links have been added for your convenience. Let us know if you make any of these dishes for your own Super Bowl soiree, and let the best team win! In last week’s post, Grandma Chic Home Part 1, we showcased this special project that Lauren had the opportunity to work on. As previously mentioned, our interpretation of the “Grandma Chic” style incorporates the use of antiques and vintage inspired furniture mixed with traditional patterns or knit elements with an overall clean and crisp color palette. 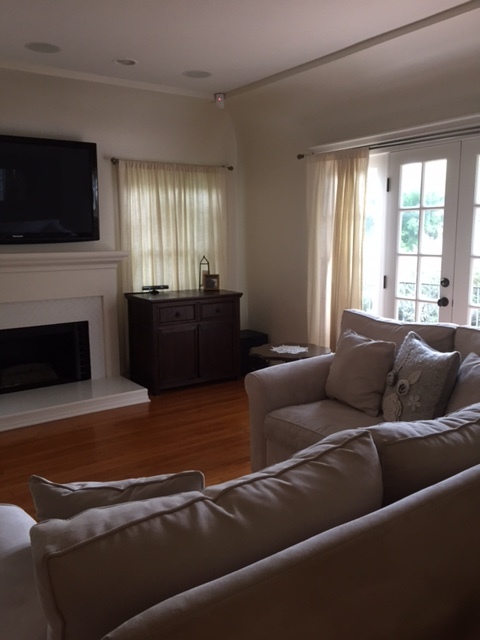 Today we continue this home tour (part 2 of a 2 part series) with the dining room and office space adjacent to the living room we showed on Wednesday. 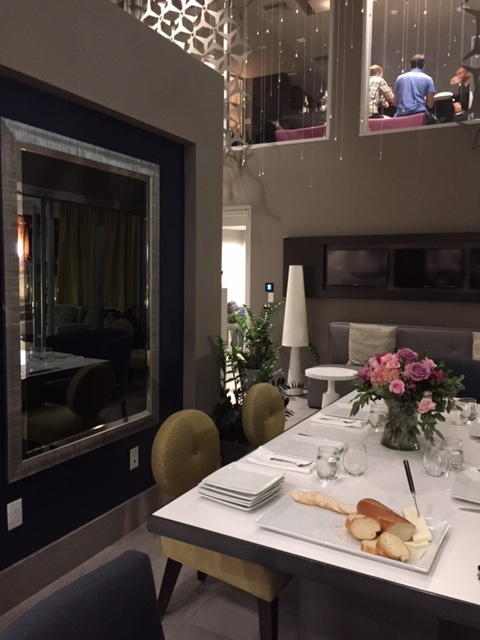 As you can see the dining room from the living room, we wanted to keep these spaces consistent in their design. We also knew that this particular couple loves to entertain and decorate for the holiday or event they are celebrating. Thus we decided an overall neutral color palette would be the best way to go. We were so lucky to have the opportunity to work with our dad on this project. 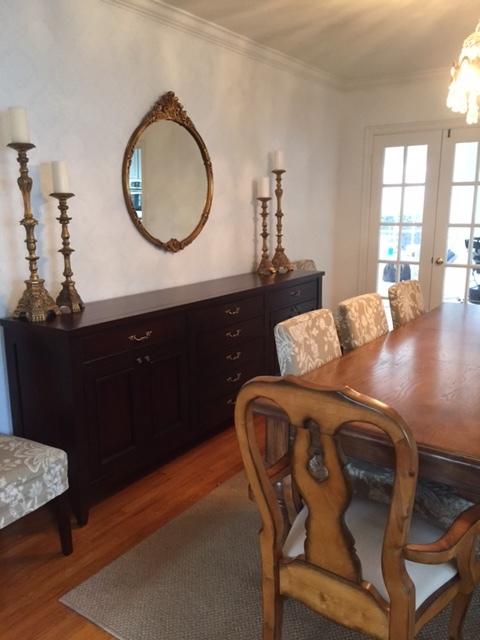 He built this gorgeous buffet per Lauren’s design, and we even hand picked the hardware. All of the other pieces in the room already belonged to this couple. Lauren helped them to arrange them in this space and to find the perfect place for each heirloom or accessory. In order to tie the whole room together and give it an overall finished feeling, Lauren suggested they do something new with the walls. 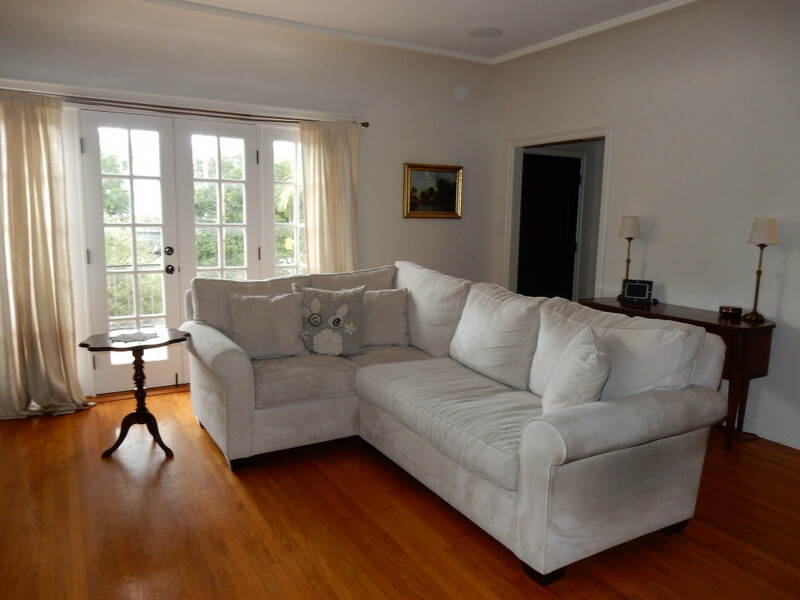 The room was a dark aubergine color which made it a little moody but not conducive to their needs for this space. 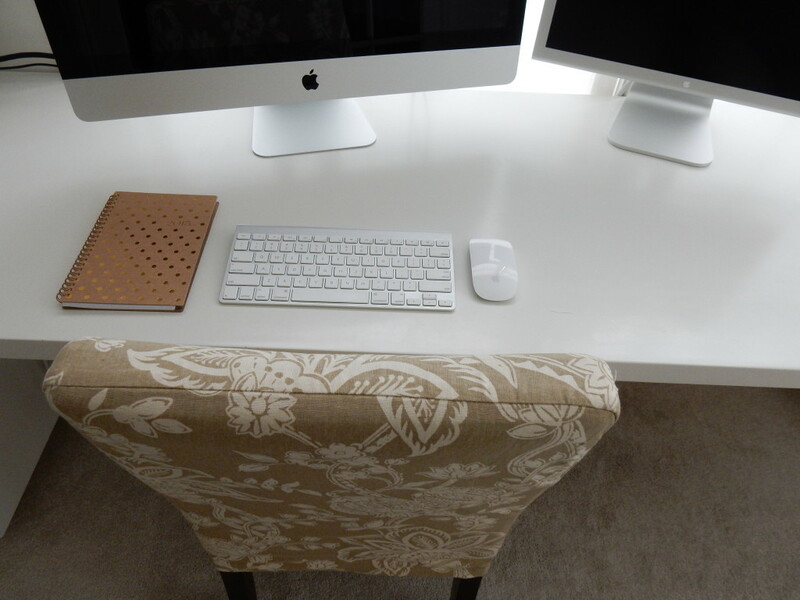 They selected this paintable damask wallpaper and love the outcome. Not to mention it is great in such a high traffic area with two dogs and a baby. Just off of the dining room was a small space that was being used as sort of a storage / catch all. The couple knew they wanted to use it as a dedicated office but needed to keep it clean and orderly as you can see it from the formal dining room and living room. Once again, Lauren worked with our dad to come up with a design for this room that would hold all of their office and craft supplies in a clean and orderly fashion and look beautiful at the same time. 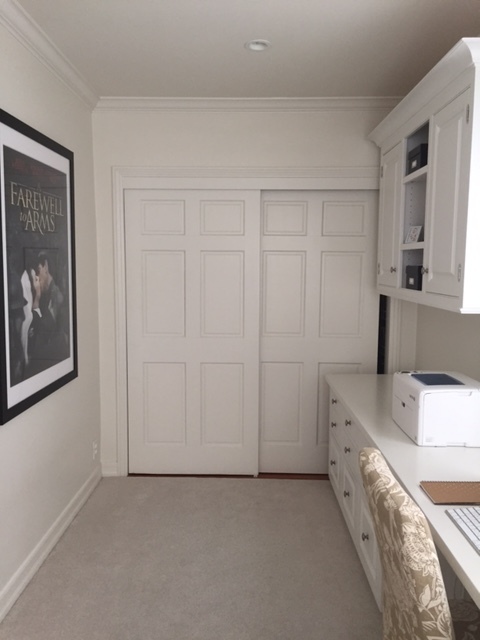 This was a bit of a challenge seeing as this space is very long and narrow, but they met this challenge head on and planned out the room perfectly. Closed cabinetry and a few small shelves for display in a white finish keeps things neat. Leigh had one of her first projects framed to display on the opposite wall. We love these kind of personal touches. 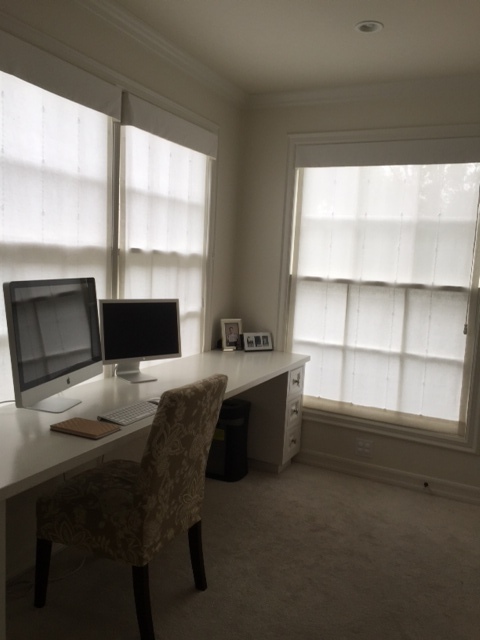 The desk area has enough space for two to work and these custom linen shades that Lauren had made soften up the space while still letting in the beautiful morning sun. 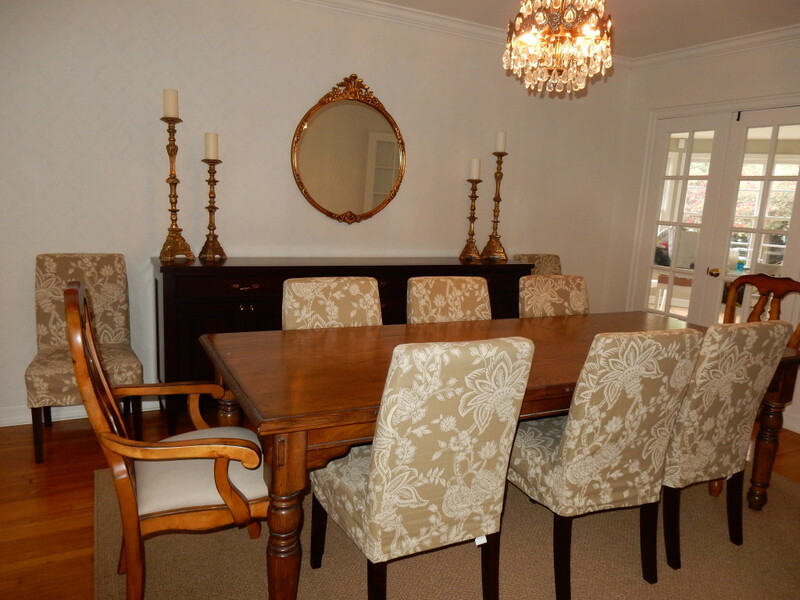 These chairs are used both in the dining room and this office space and help tie the two areas together. This really was a fun project to work on, and we love that we were finally able to share it with all of you. What makes projects interesting are the different styles and clients we get to work with. 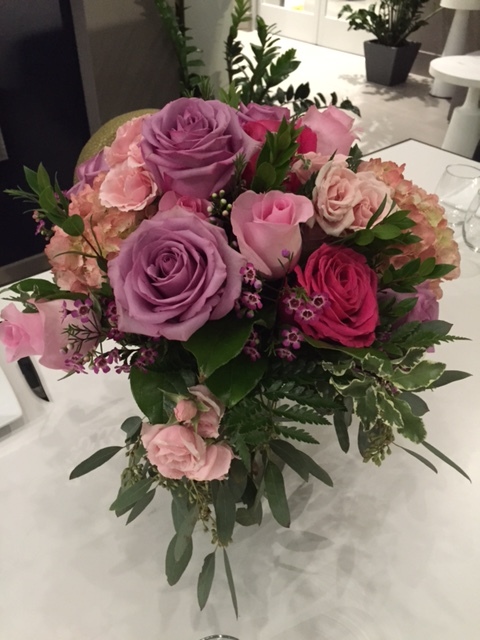 We love it when our clients bring something new to the table and challenge us to think outside the box. Thank you again Leigh and Gregg for giving us this opportunity and for opening up your home for all of us to enjoy! When we first started Side by Side Design, one of our friends enlisted Lauren to help her out with her home. They worked collaboratively to come up with an overall concept and came up with a style they lovingly call “Grandma Chic”. Leigh had very specific requests for her home. She wanted to keep things light and airy as well as soft and cozy and had lots of antiques / family heirlooms to incorporate in the design. 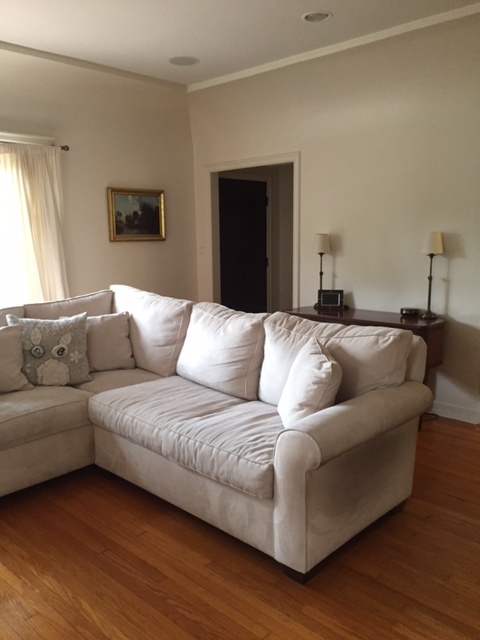 She joked that her style was a little Grandma-ish for a young family, but they knew that keeping the overall color scheme light and neutral with lots and lots of white would balance it out. Sometimes you finish a project and never really get a chance to go back and photograph it properly, but we feel its better late than never and are so excited to finally have these photos to share with all of you. Today we will showcase the living space which sets the tone and color palette for the rest of the house and will continue with Part 2 of this two part feature next week. We hope you enjoy! All of these pieces were already existing but moving them around slightly in the room helped to give the space an overall balanced feeling. Small details such as this adorable knit pillow, the antique lamps, and the gold framed painting give this room its character. 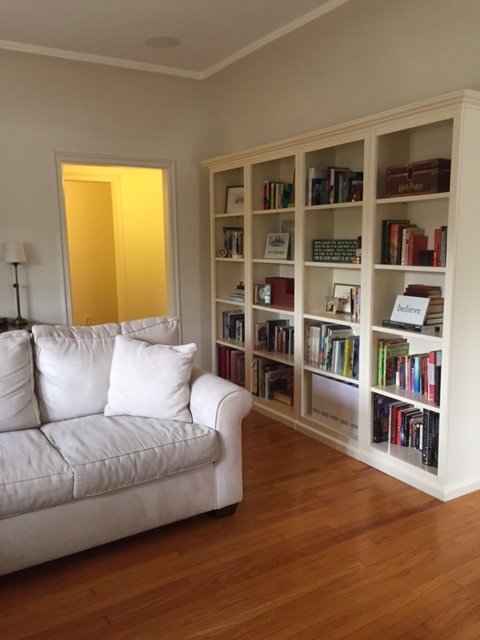 Leigh and Gregg are avid book collectors, and this bookcase was purchased to fit the space as well as hold some of their favorites and some family photos and keepsakes. This dark wood sideboard, which houses all of the media equipment, looked so great in front of the soft white draperies. Therefore, Lauren begged them to keep it in its place. 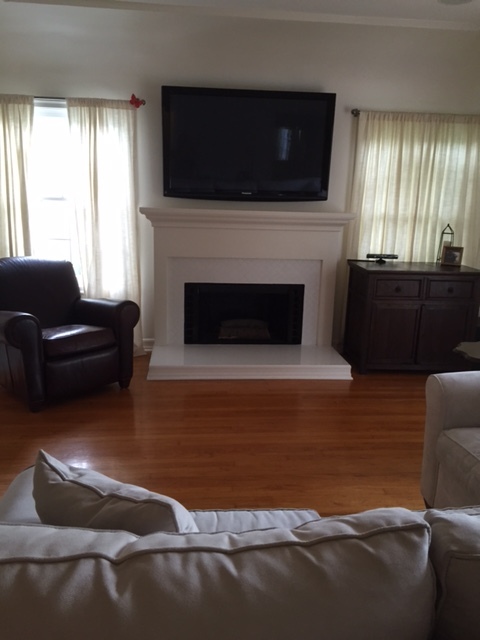 They placed an existing leather chair on the opposite side to balance out the media cabinet, and we love how it looks. 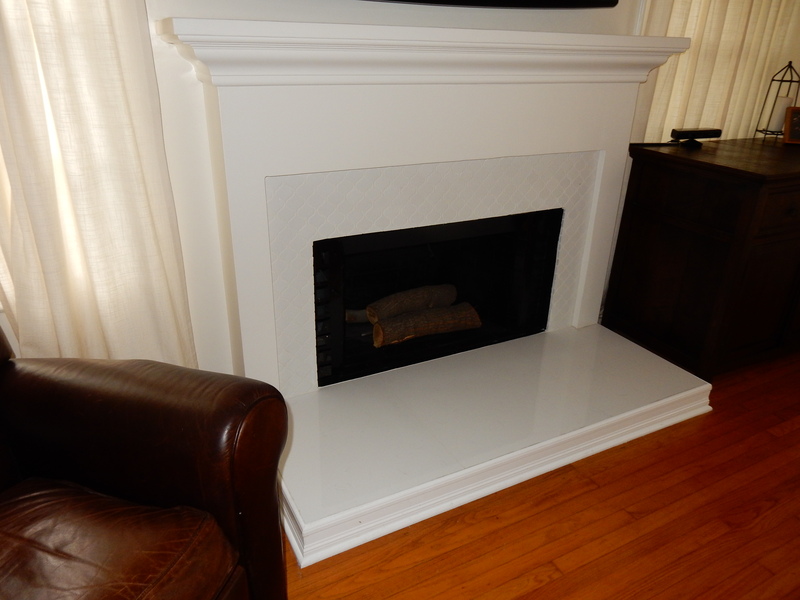 The fireplace was the biggest project for this space. The white surround was existing and they loved the clean look but the interior was filled with black marble and was overly harsh. 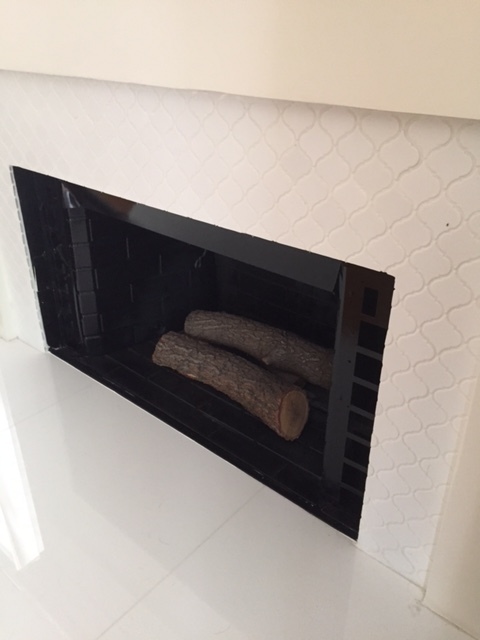 They selected this white Moroccan tile and decided to go with a white stone hearth as well. We absolutely love how it turned out! Stay tuned for more of this Grandma Chic Home on Monday. 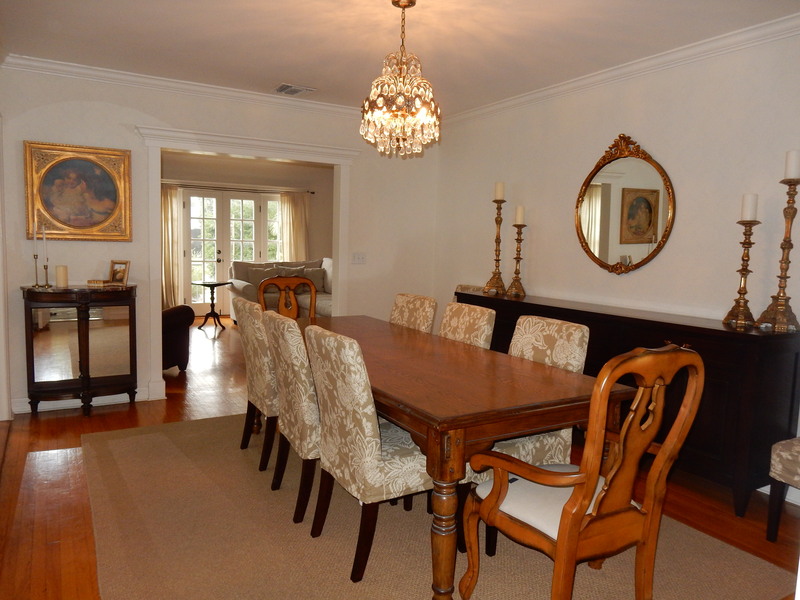 We will be sharing the dining room and connecting office. Thanks Leigh and Gregg for allowing us to share your home today. 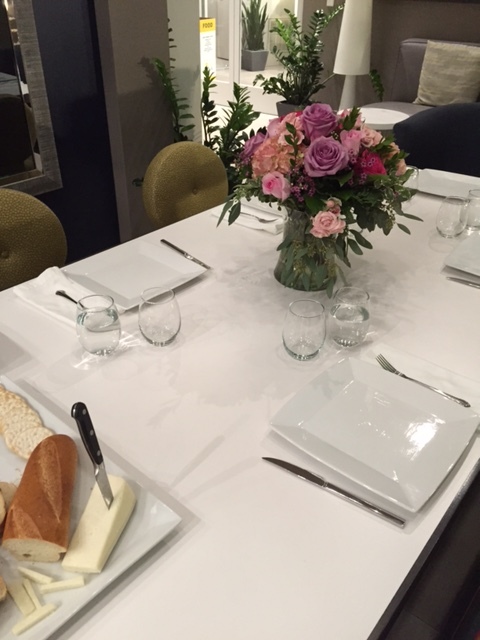 We love getting the opportunity to work on a special project for a special family.